Finally, an agency has figured out how to get old-fashioned direct (snail) mail noticed–coat the flyer in drugs, of course! 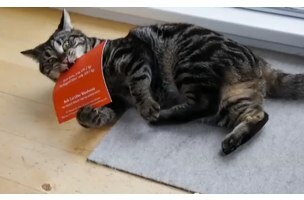 Okay, it’s not actually as bad as it sounds; Vancouver agency Rethink lived up to its name by rethinking how to get cat owners to pay attention to a flyer advertising kitty litter (by coating it with catnip). While such “junk mail” might usually be tossed into the recycling bin without a second thought, it’s rather difficult to ignore or throw away a piece of paper that your cat has latched itself onto with purring, drooling, trembling gusto. While we likely won’t be seeing a human equivalent anytime soon (as the feds would probably frown upon flyers coated in ecstasy), we must say this is one creative campaign that’s hard to ignore.